London - Former foreign minister Boris Johnson urged the British government on Wednesday to change its strategy for leaving the European Union (EU), telling members of Parliament (MPs) it was "not too late to save Brexit". In his first speech to the House of Commons since resigning last week, the leading eurosceptic repeated his criticism of Prime Minister Theresa May's plan for close economic ties. By offering to follow EU rules on trade in goods, without any say in making them, "we are volunteering for economic vassalage", Johnson said. But he insisted: "It is not too late to save Brexit. We have time in these negotiations. We have changed tack once and we can change again." He argued that the problem was not that Britain had failed to make the case to Brussels for an ambitious free trade deal, but "we haven't even tried". "We must try now because we will not get another chance to do it right," he said. She defended her proposals as "the right package", saying: "We're delivering on what people voted for." But Johnson said May had gone back on her "glorious vision" for Brexit, which involved breaking from the EU's courts, customs unions and single market, and forging new trade deals. "A fog of self-doubt has descended", he said. "We dithered and we burned through our negotiating capital," he said, noting the agreement to pay billions of pounds to settle Britain's financial commitments before any deal on future trade. Johnson demanded Britons "believe in this country". "There is time, and if the prime minister can fix that vision once again... then I believe she can deliver a great Brexit for Britain," he said. 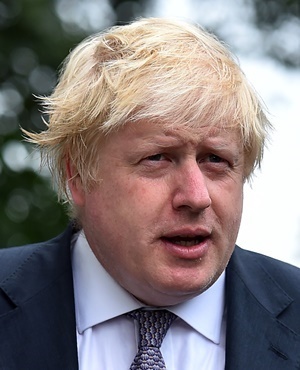 Johnson's speech was welcomed by eurosceptic MPs, with Conservative Andrew Rosindell saying it was a "brilliant" call for Britain to "have the self-confidence as a nation to complete a true BREXIT". But critics said it was far from the rousing rhetoric for which Johnson is known. "Boris Johnson's after-dinner speaking fee must have plummeted faster than the pound after that dreary, self-important resignation speech," said opposition Labour MP David Lammy. West Streeting, a Labour MP who supports the campaign for a second referendum, said the speech was "a total damp squib".